The rear fog light helps your vehicle to be seen. When the lights are turned on, the rear fog lights indicator light in the instrument cluster turns on. position before turning on the rear fog light. The rear fog light indicator light in the instrument cluster illuminates while the rear fog light is on. The rear fog light indicator light in the instrument cluster goes off when the rear fog light is turned off. The front fog lights turns on when the rear fog light is turned on. automatically), the front fog light indicator light in the instrument cluster will also illuminate. turns on when the headlights, the exterior lights and instrument panel illumination are on. 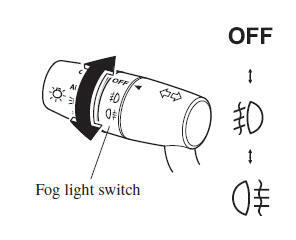 The headlights must be turned on to turn on the rear fog light. 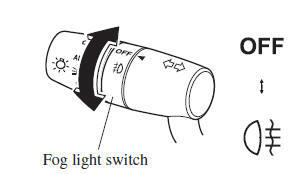 fog light switch returns to its original position automatically). position again (the fog light switch returns to its original position automatically). position, the rear fog light can be turned on when the headlights, the exterior lights and instrument panel illumination are on.